It appeared on the family room coffee table a few days before Christmas. The mystery was born as a jumble of a thousand uniquely-shaped pieces of pressed cardboard. Sure, there was a picture on the box of what it was supposed to look like when completed, but there was no guarantee of the outcome. To make something out of the seeming chaos of colors, shapes and sizes required faith, curiosity and a commitment to complete the task at hand. Regardless of the varying degrees of interest, virtually everyone who entered our family room participated in locating necessary pieces of the jigsaw puzzle. Slowly, after hours of painstaking piece by piece assembly, the perimeter straight edges were all located and put in place. 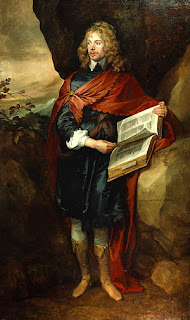 This defined the dimensions and potential for the remaining pieces, the frame within which, assuming all went well, the picture would take shape. Critical though this fundamental step may have been, it was hardly much of a conquest. But that didn't stop those of us present at the time from expressing our common feeling of accomplishment. From then on, the puzzle became a common compulsion, a mission that recruited one member or another of our extended Christmas time family. From time to time, whether casually or in earnest, friends and family would lean over or kneel beside the table and stare intently at the small colored cardboard cutouts. Even PJ, my three-year-old grandson, got into the act. "I can help with the puzzle, Grandpa", he insisted, picking up pieces at random and attempting to press them indiscriminately into place. Easily bored with the concentration required by the adult distraction he found his own puzzle of some 25 pieces. "See Grandpa, mine is finished", he announced, as if to chide us for our own retarded progress. Of course, we were not driving matchbox trucks and cars over his puzzle as he did over ours, scattering well-placed clumps of emerging images onto the floor and who knows where else. More than a week after it was begun, the puzzle was finished. Or at least as finished as the remaining pieces would permit. There were three noticeable holes in the completed picture, which we deduced was due to three pieces having gone AWOL with a three-year-old boy. 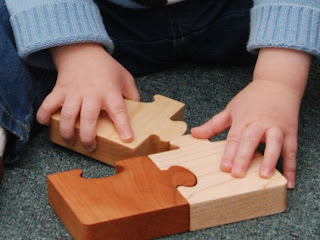 Searching unsuccessfully in every conceivable hiding place, I wondered out loud when, if ever, those missing pieces would reappear in someone's shoe, trapped in the trunk of some hidden toy car, or stuffed into Mr. Potato Head. Regardless, we had gone as far as we could, having spent countless hours striving to place those little puzzle pieces in their perfect places to form the picture on the box lid. 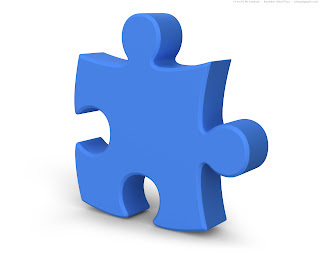 Some might characterize the task of putting together a jigsaw puzzle as senseless behavior; a mundane and meaningless, yet addictive, activity leading to an anticlimactic achievement, after which it would be returned to its former condition and placed in some darkened closet, most likely never to be seen again. 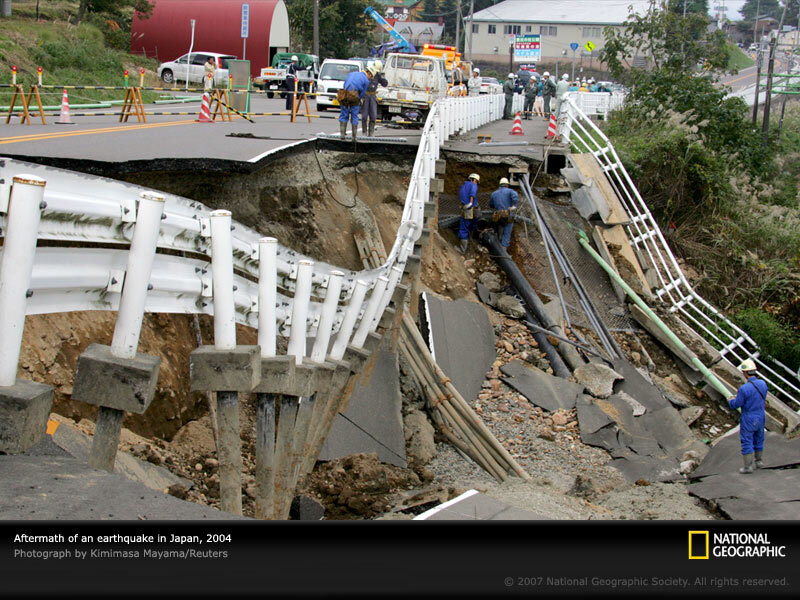 A look at the history of jigsaw puzzles suggests otherwise. 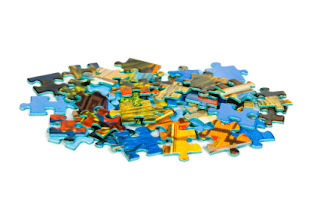 The jigsaw puzzle was invented in 1767 by John Spilsbury. It was a wooden map of the world with each country cut out as a separate piece, thereby designed by the English mapmaker for teaching geography to children. The puzzles continue to be used for teaching children and did not catch on with adults as a means of entertainment until more than 100 years later. Over the past week I have begun to see that jigsaws have stayed true to their original purpose and can still teach lessons about life, and about Parkinson's disease. Some things to ponder as we end 2011. 1. We all start life as a mysterious genetic jumble of potential. 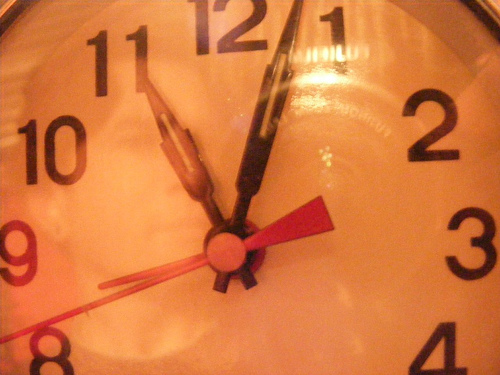 Humanly speaking, the final image constructed upon the chromosome limitations we inherit is never known ahead of time. We are a work in progress. In effect, our puzzle is being assembled without a clear picture on the box lid. We must simply do the best with what we have been given, as and when discovered, be it defective dopamine-producing cells or otherwise. 2. 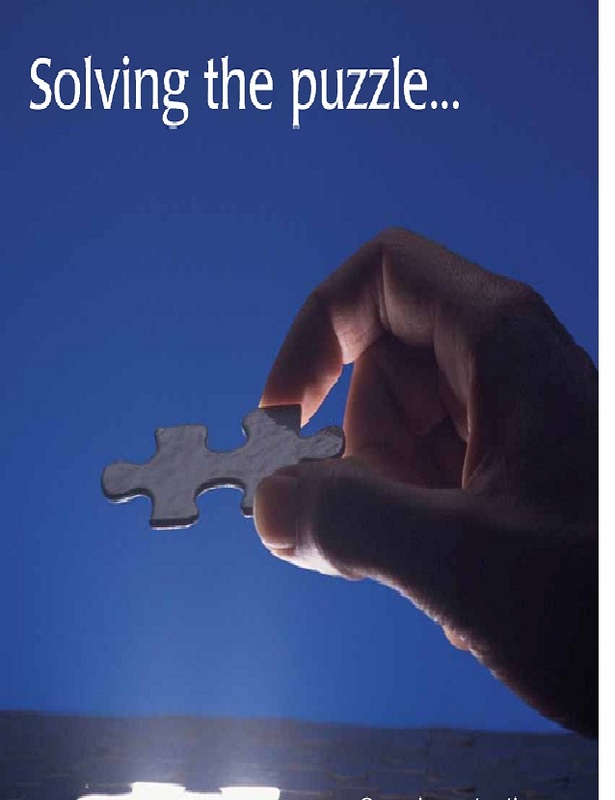 The best way to put together a puzzle is by having the perspective and participation of numerous people, all contributing their concerted, or even casual, efforts towards development of the final product. Some of them may never see much more than the early outline of what we are to become, while others are only present to see the triumphant placement of the final piece. Just as our lives are best constructed by the contributions of many, so too is our perspective on living with Parkinson's disease. Despite the fact that progress may be slow at times, we can be encouraged by the fact that the placement of one "piece" can be enough to allow many others to fall in place. 3. We are all exposed along life's way to mishaps and mischief, both of which can result in us lacking or losing some apparently needed pieces. As a result, the picture may never be perfectly complete. But the missing pieces, like a diagnosis of PD, are part of our story. Will it be a bitter one or a better one? Will it tell of resilience or resignation? Those choices are ours. 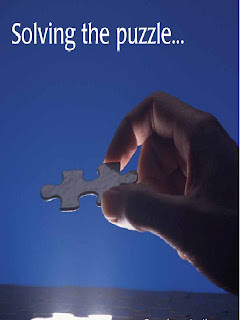 "More often than not the pieces of the jigsaw puzzle that is your life will come together in a manner beyond your currently ability to imagine…. The right pieces will come together at the right time. It’ll all work out." Stephen Cox, "The Jigsaw Puzzle of Life". 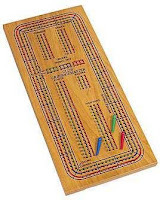 "15-2, 15-4, 15-6 and a pair is 8", he announced as he moved his red peg eight holes ahead on the oval track of the cribbage board occupying the table between us. My father-in-law and I play Cribbage most every time we are together. It has become a tradition, as it was when my father was alive. 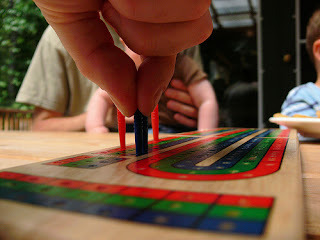 Even before that, I spent many hours learning the niceties of the game from my grandfather, who often tried to "cheat", with a smile and twinkle in his eye, just to see if I was watching him score his points on the board. In my family, board and card games were the staple of every family get-together, especially Christmas. With the popularity of video, computer, iPhone and other electronic distractions, table games have seemingly lost their luster. But, for me, Cribbage still remains the constant; a comforting custom of Christmas. For those of you who may be uninformed, Cribbage, or "Crib" as it has been shortened to, is a simple card game, requiring some thought, strategy and attention in order to play well, but leaving plenty of opportunity for discussion, joking, poking fun and other male expressions of friendship. The inventor of the game, Sir John Suckling, was a cavalier English poet of the early 1600s. He was appropriately known for his carefree spirit and wit, despite a self-inflicted end to his own life at the age of 33. My father-in-law, Louis, wears his 82 years extraordinarily well. But 50 years as a stonemason, holding large stones in one hand while shaping them by blows from a heavy stone hammer held in the other in order to place them perfectly in a wall, have taken their toll. While his stonework was often a work of art, he has suffered, as most artists do, from the consequence of long hours perfecting and pursuing his craft. The pain from worn out joints and tired, overworked muscles remind him constantly of the price he has paid for his passion for perfection and hard work, often in the cold or inclement weather. 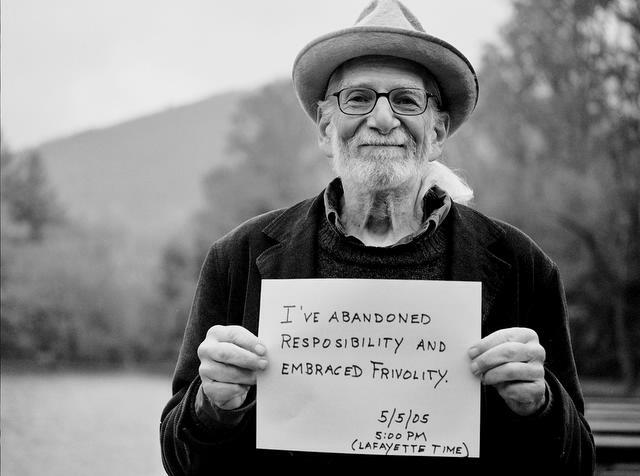 Despite life's pounding which has taken place over more than eight decades, he smiles and laughs at any excuse, but always when he is playing Cribbage. Despite my own evidences of Parkinson's disease, disabling my skill at shuffling and dealing the cards as quickly as I once did, I enjoy these times immensely. Perhaps it is the game, or the distraction it offers from some pain, troubling symptom or other of life's challenges. Maybe it is the warmth that, wrapped in the friendly banter between us, has grown consistently since he welcomed me into his family some 40 years ago. Despite the fact that the game facilitates competitive rivalry, both of us trying to best the other, moaning about the bad cards that have been dealt, complaining about the luck of the other, or threatening retribution after losing a game, there is a sense of comfortable camaraderie when we play. It feels like sliding one's feet into a well-worn pair of slippers or putting on an old, favorite sweater. It keeps the chill away and warms your heart at the same time. 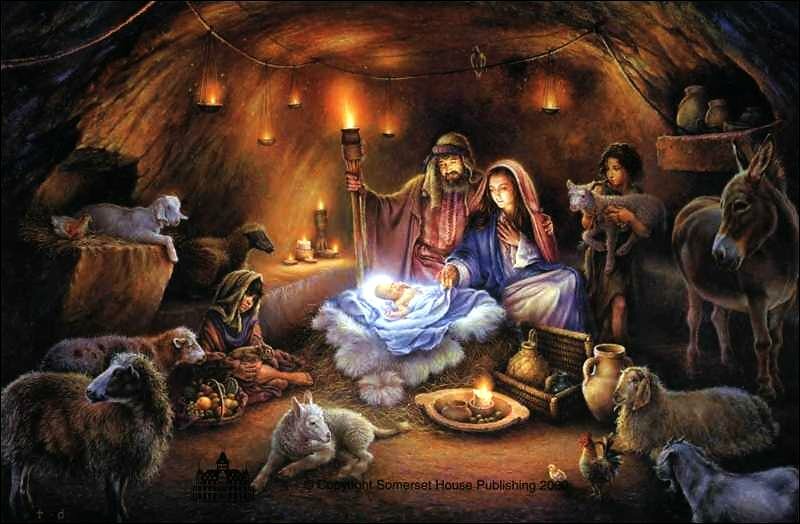 Perhaps there is some correlation between the "crib" of that first Christmas, and the customary Christmas games of "Crib" that have formed my definition of good, family, Christmas time. There is a sense, despite the apparent lack of any logical relationship, that both cribs communicate that "all is well with the world". Both, if I am honest with you, give me a feeling of well-being, a simple sentiment of "goodwill towards men". 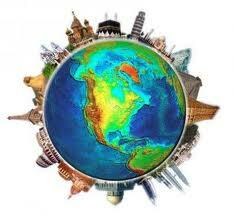 In a time when living day-to-day can be demanding, they both offer, to a greater or lesser extent, a place of peace. 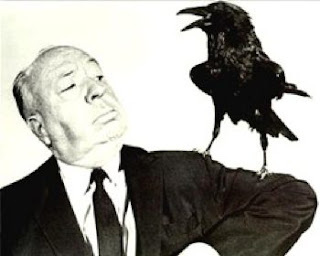 Tonight, year-end deadlines gather and perch in my thoughts, impatient like Hitchcock's "Birds" on nearby power lines, ready to swoop down, sinking their claws of guilt deep into my conscience. Only a few days ago, at least it seems, the year was fresh. But now 2011 has all but disappeared, leaving too much disappointment. How easy it seems to beat ourselves up (and perhaps others) for failure to meet our expectations. Or blame my demon, Parkinson's. Last night, four of us, good friends for all kinds of reasons, sat for more than four hours in the small and seasonally noisy restaurant. We had enjoyed meals there together before, shared stories, laughter and heartaches, but last night seemed different. It was one of those times when everyone seemed to share a common theme, something that bound us together, as it does much of our generation, without fully recognizing it. We were driven by high expectations. And, more powerfully, we bear the burden of them unfulfilled, at least to some extent. Other patrons, seated nearby, glanced up from time to time and must have struggled to decipher the snippets of intense discussions they had overheard. When we finally surrendered up our table we felt a little lighter, not physically but emotionally, yet the question plagued me. How can we stretch toward the stars, make dreams come true, and pursue the barely possible, without the whiplash, the fatigue and the soul-deep sense of loss and failure? Perhaps, and this is but my theory, my peers and I, in our thirst for achievement, our naïve race towards frontiers of unimaginable complexity, and our mindless pursuit of plenty, we failed to see that we must ultimately lose all that we had gained. We failed to learn the good of that. It is in failure that we learn what we're made of. It is in the simple that we gain depth. It is through the losing that we recognize true value. It is in knowing need that teaches us thankfulness. It is through fear that we experience current. And it is in sharing them all that we know love and true friendship. So as the door closes on another year, and I am tempted to do penance for my failures, my promises unkept, and my deepest disappointments, I will not call them failures but simply a prayer for strength and humility so that I might grasp the opportunity to grow and learn. Who knows the tests ahead? There is room for failure. Despite being 12 noon, the temperature hovered just above 0°C outside the hospital main entrance. It was Friday. The week was nearly over. I took deep breaths, enjoying the crispness of the air. I smiled as I remembered the medical miracles of the past five days. It had been eight o'clock that morning, when I was allowed through the coded-entry door into the special department tucked away in the basement of the hospital. It was right beside the chapel. While the mandatory one-size-fits-all yellow pajamas I wore were neither flattering nor fashionable, they did serve the necessary function better than those notoriously revealing, impossible to tie, hospital gowns. Stripped of metal, including my wedding ring, I had followed nurse Nicole as she explained what was about to happen. 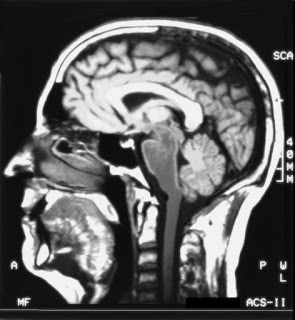 I was to lie down on a stretcher, head pointed toward the gaping doughnut hole of the Magnetic Residence Imaging (MRI) machine into which I was to be thrust. Ear plugs were inserted, on top of which were placed snug fitting, industrial-style hearing protection devices. A Velcro strip was used to fasten my head to a frame, which in turn was slid into a "helmet". I looked like a Viking warrior ready for battle or immolation. 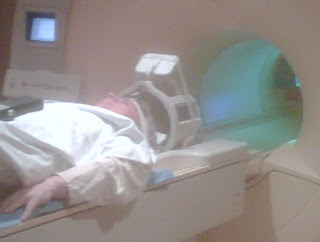 The MRI tube I was slid into was just wide enough for my shoulders. My only communication from the outside world was accessed by looking directly up into mirrors placed at 45° angles so as to enable me to read a computer monitor. On the screen appeared Nicole's reassurances like, "Are you okay?". I was tempted to nod. Over the next 45 minutes or so, the sophisticated MRI equipment that had swallowed me made intermittent sounds like a poorly maintained gravel crusher and a high-powered chainsaw left running at top speed. This explained the hearing protection. After a short break, and time to take my Parkinson's medication, it was back into the enamel culvert for more Kodak moments. 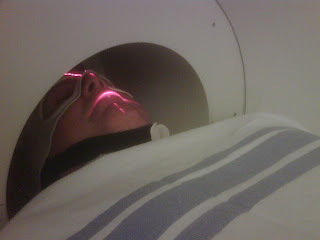 Apparently, this high-priced apparatus had the ability to take precision pictures of my dopamine depleted brain. The week had begun, Monday morning, in the comparative quietness of another technological tunnel. Then it had been a Positron Emission Tomography scanner (PETscan). There, instead of exposing me to very loud sounds, I was injected with radioactive isotopes that were supposedly successful in navigating certain convoluted pathways in my brain. The "tracer" is like a luminescent paint used to highlight aspects of neurological function (or dysfunction in my case). Again, this enabled particularly important photo ops of glowing brain bits. On Tuesday morning, having just peeled off the round little Band-Aids from the PET scan injection sites on the inside of my left arm, I was privileged to be given supposedly safe dosages of hepatitis A, hepatitis B and typhoid fever. These vaccinations were delivered with a smile and three stabs, one in the right shoulder muscle and two in the left, followed by three more round Band-Aids. Just a few more appointments, and an indeterminate number of body piercings, and I will be the proud beneficiary of immunity to virtually every disease known to man (except, of course, the one that I have already). Of course, none of the events explained above are anything other than the necessary consequences of volunteering for studies on people with Parkinson's, and preparing for my round the world trip starting in May 2012 (more details to follow shortly). I am humbled by these medical opportunities, recognizing that few people in the world would have had the high tech treatment in their lifetime that I received this week. We are all prone to complain. Yet, we do so as spoiled children. In fact, it seems that the more we have, the more we complain about. Life is full. This weekend I'm going to spend some time outside. 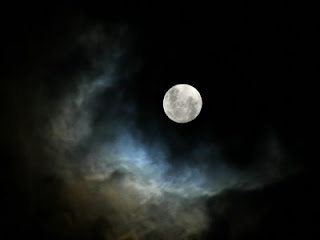 Just breathing in that cold December air and marveling at the beautiful full moon I get to enjoy. It was 1967. 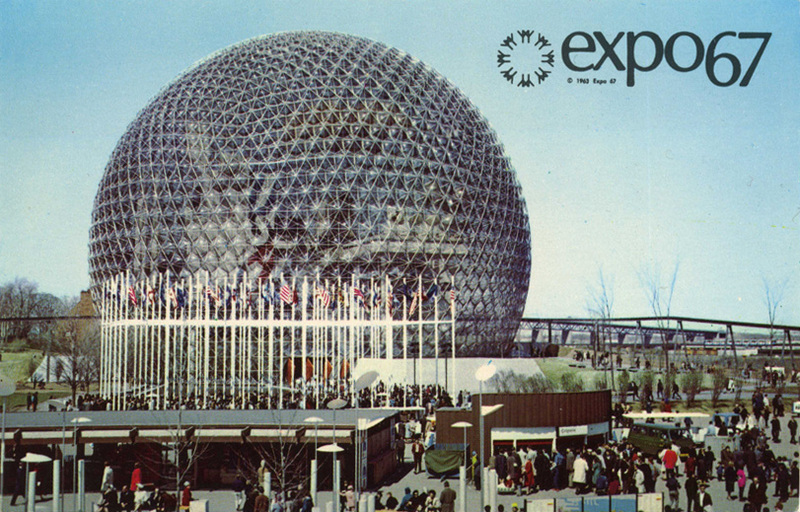 The world exposition was in Montréal. And I was there. I had never been so far away. I knew it was 2700 miles (4300 km) from my home, but it was even further from the cultural cocoon that was my apple orchard upbringing. The train trip took more than three days, an adventure on its own. 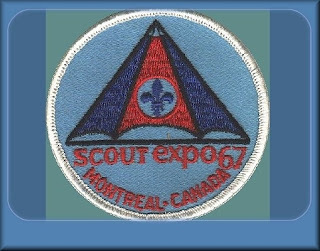 I was sent as a representative of my Coldstream scout troop to demonstrate scouting skills at the Scout Pavilion for a week with several dozen other boys from across Canada. There, for the first time, the small, naïve, simple, rural world of 15-year-old farm boy collided with the metropolitan sophistication and complexity of a world-class city. It was a game changer. In 2012, there will be a repeat performance. Not in Montréal, as chic and cultured as that great city may be. No, this time the stakes are higher. 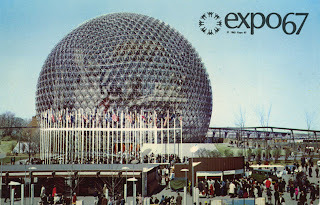 But just like I did in those months leading up to Expo 67, I find myself consumed with dreams of drama and adventure, encountering the extraordinary and the unexpected, and meeting people of tragedy and mystery. Instead of countries from around the world going to Montréal, I will be going around the world to 15 different countries. Inevitably, it will be a game changer. 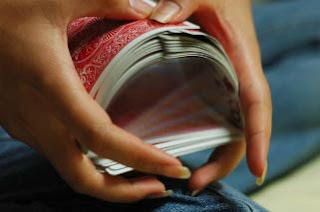 Days flash by like cards shuffled into the deck, never to be seen again. A glimpse, a blink, a breath and they are gone. Memories…yes…but even they often burrow their way quickly into the hidden creases of my mind to find a home amongst so many others. Weeks, months, and even years, fade into the rearview mirrors of our lives, sometimes with little to distinguish one from another. True, each day holds its treasures if I am careful to search, listen, and wait patiently. But sometimes, whether by plan or serendipity, like permanent marker on a whiteboard, someone or something creates indelible marks on our lives. Out of the ordinary, beyond the mundane, or just being at the right/wrong place at the right/wrong time, those times leave us vulnerable, shaken. Shaken! Literally, that is how Parkinson's disease affects a life. 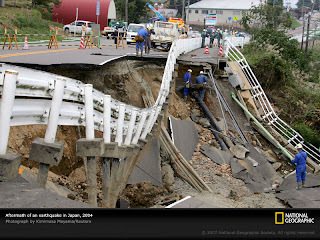 Like an earthquake, it rattles the daily protocol, shatters our plans and perspective and topples all but well-grounded priorities. And struggling through the aftermath of diagnosis you discover what is important: family and friendships that go deeper than disability, plans and purposes that stretch beyond the comfortable, and an awareness of each disappearing day that starts more easily than it ends. Whether by reason of PD or simply the passage of time, we must see life for what it is: a voyage down a river that picks up speed as it goes. We need not be passive passengers floating mindlessly. We are each given a paddle, and with it we have choices. What shores will we explore? What boats will we hail? Or will we choose to sleep or stare at life from a distance? 150 days from today; May 1, 2012, a new adventure will begin. And in the meantime… Well, I will plan, prepare and pack for the journey. And I will dream of the days ahead.